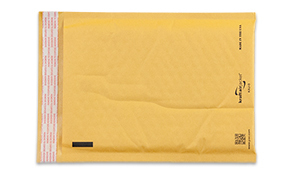 6 1/2 x 9 1/4 bubble mailers in brown kraft paper. Features an easy to use and tamper-evident Peel & Stick closure. Simply remove the strip of paper covering the glue and close the flap to seal. Sturdy and lightweight so you can keep shipping costs down without sacrificing protection during transit.